My laundry room gets lots of traffic. It's located in the center of our house, and has two doorways, one to the kitchen and one to the main hallway. 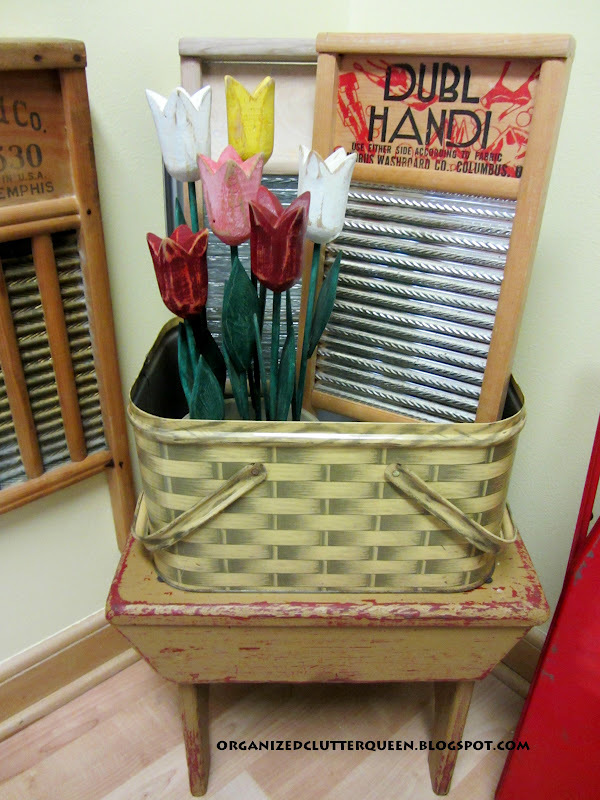 My laundry room is decorated in a vintage style. This vignette started with a chippy, red and mustard painted bench. Then I added a vintage metal picnic basket, vintage wooden distressed tulips (from one of my recent posts) situated in a small crock, two small washboards, and a red metal toy ironing board from my childhood collection. 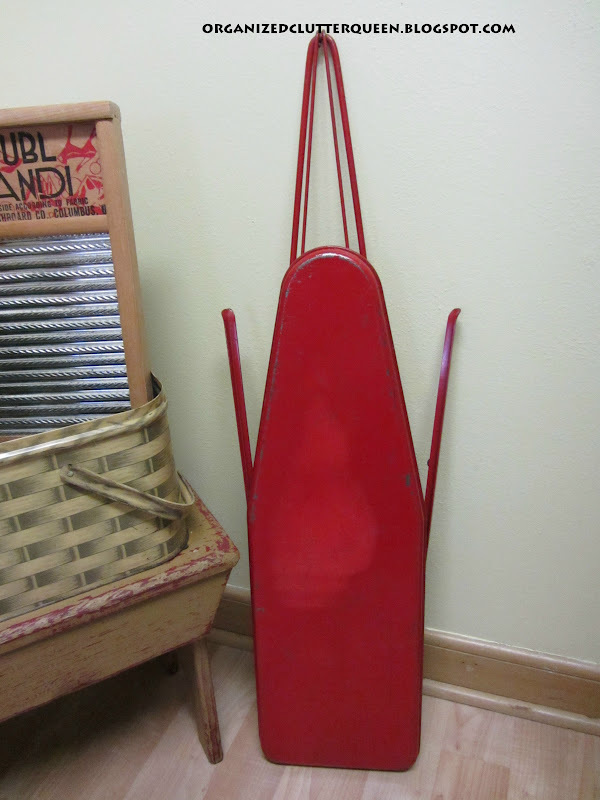 Another larger washboard is hanging on left. 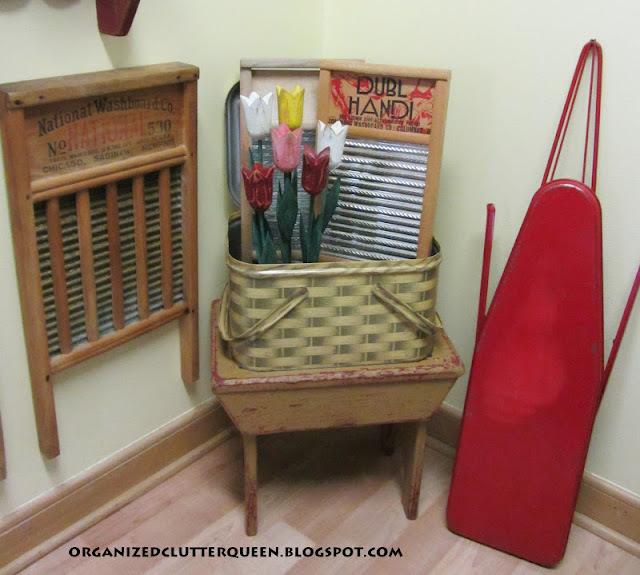 These items say 1950's to me, how about you? 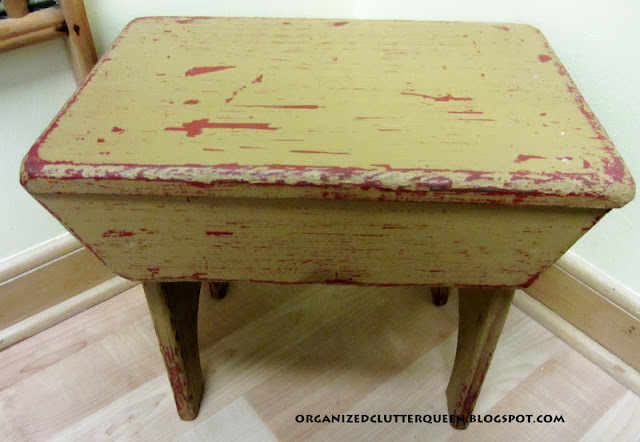 It does says "50's"...really cute, love the little red ironing board. Thanks so much for visiting my blog today. I will follow you on my way out. That basket certainly screams 1950s! Beautiful setup, I love it. 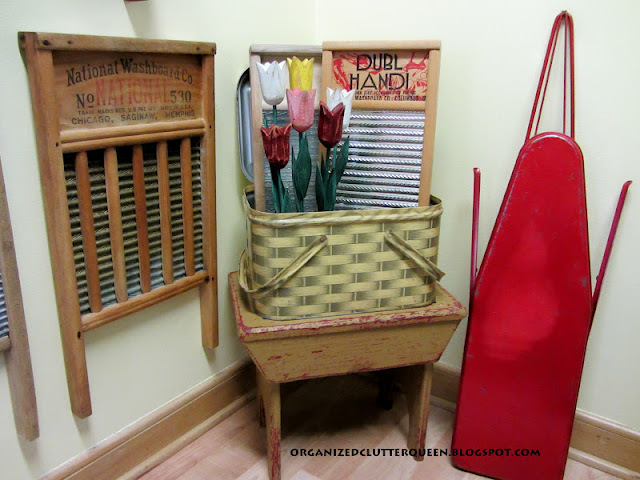 What a cute laundry room! I love vintage, too. 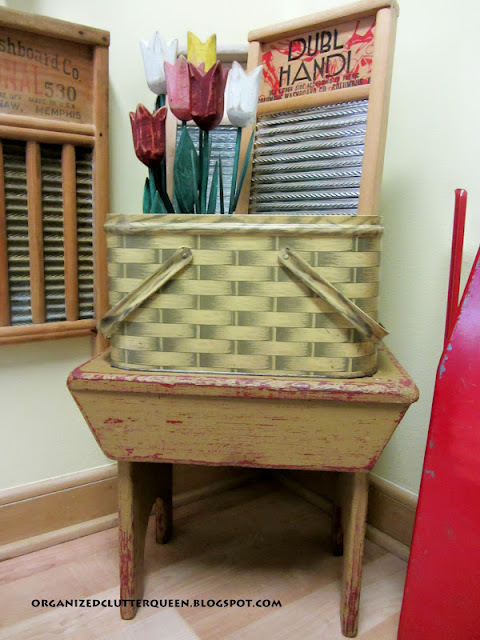 I have an old wringer, washtub and scrub board in my laundry. I'm inviting you to link up at our WIW party, we'd love to have you! I love your vintage laundry. The bench is wonderful. And I love picnic baskets. Definitely 50's to me. 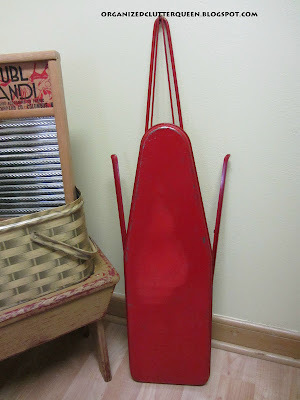 I have a red play ironing board, too, but mine has holes in it. I wonder why? 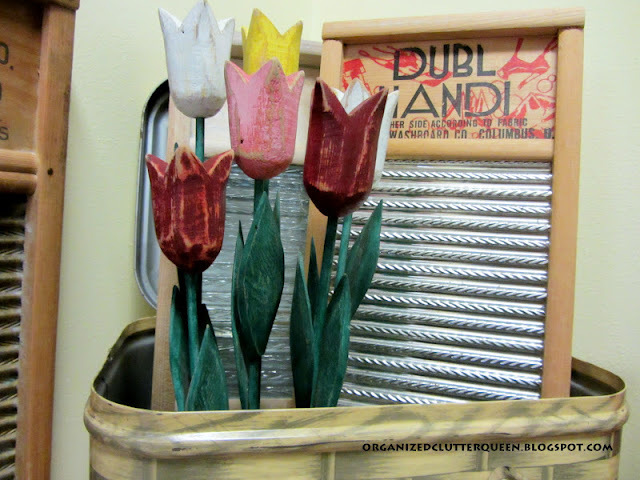 What a beautiful way to brighten up your laundry room! I LOVE it!!! Yes...your vintage vignette definitely sings "50's"! 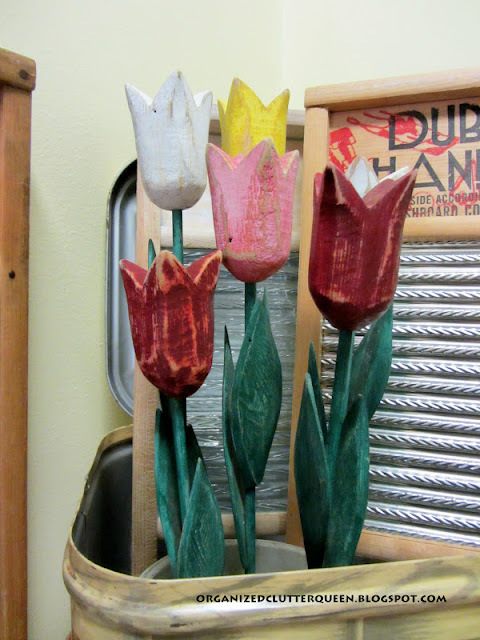 It's always so much fun to add vintage items into a decor. I love your chippy bench...very pretty. Oooh...and the metal basket...is awesome! Thanks so much for sharing your beautiful home with us! This is my first time to visit your blog. It's so very nice to meet you! Oh I can already tell from the first post I have looked at that I am going to love your blog. You have a knack for display for sure. That is adorable. Okay going to look at your past posts. Love it!! Just over from Cozy Little House. I love your wash boards. I have several very old ones. What a cute display. Your laundry room must be way nicer than mine. Mine is very "utilitarian". It's on my list of things to fix up, but there is too many other things ahead of it. I love that little bench! So adorable. Looking forward to following your blog! Visiting from Cozy Little House...Great blog you have here. Oh, I love your vintage laundry room vignette! It is so cute. Thank you for joining last week's TTF. I hope you are have a great day! My laundry room is just a space in my not so nice basement so I decorated the walls going down the stairs. I have a cute child size ironing board as well--mine is white with owls all over it. Most of my stuff is reprop--I just picked up a cute metal sign that is an old Ivory ad. Love it! !